The Lighthouse building was formerly the Glasgow Herald newspaper office designed by famous Glasgow architect Charles Rennie Mackintosh. 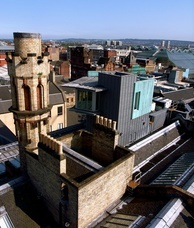 The derelict building was given a second lease of life in 1999 when it was transformed into Scotland's Centre for Architecture, Design and The City. Tucked away on Mitchell Lane in the city centre, The Lighthouse is a narrow building full of staircases and escalators leading to a variety of exhibition spaces and conference facilities. The venue is used for private and co-operate functions, as well as event launches and a diverse programme of exhibitions. On Level 3 is the Mackintosh Interpretation Centre which explores the life and work of Charles Rennie Mackintosh. With video narratives on his work, detailed studies of four key building designs by the architect and building tours five days a week, The Lighthouse is the perfect place to start your Mackintosh journey and admission is always free - hurrah. Andrew Tibbles: AI: Oh, Aye!